Well, I bet this suprised you! No pictures of North Wales for October 1978, so something a little different. 76009 (and 76013 behind) pose for photographs at a very grey Penistone station, whilst working the D1041 Preservation Society's 'Pennine Explorer' railtour on Saturday 14th October 1978. The tour started at Cardiff, and the 76s worked Manchester Picadilly - Tinsley Shepcote Lane - Rotherwood - Manchester Piccadilly. 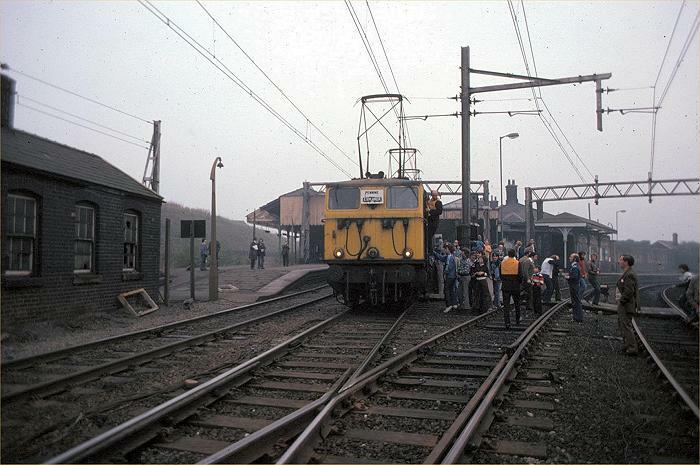 Penistone was of course on the electrified Woodhead route between Manchester and Sheffield. Passenger services over Woodhead had ended in 1970, and all traffic on the line was to cease within 3 years of this picture. Penistone station still had a passenger service in 1978, from Huddersfield to Sheffield, which used the platforms to the right. This service still runs today, and, although it no longer uses the direct route to Sheffield, it is much more frequent, with hourly departures in each direction from 6am to 11pm. Loco-hauled railtours you won't see though - a weight restriction near Huddersfield prevents that. And a North Wales connection? Well, Class 76s were often visible from Crewe-North Wales trains as they waited in the sidings opposite Crewe Works on the way to or from overhaul. Even more tenuous connection: In the original tendering for the Trans Pennine franchise, Arriva's bid included reopening the route over Woodhead, and running a new service between Manchester and Sheffield with a journey time of 35 minutes. This was far too ambitious for the SRA, so Arriva didn't make the cut. They obviously learnt their lesson, and got the Wales & Borders franchise by offering extra car parking, some leaflets in Welsh and 7 Class 150s. Both Virgin and Central Railway have also proposed reopening, but the only traffic passing is on foot, bicycle or horseback.